After a long absence, we are back to blogging! Welcome readers! 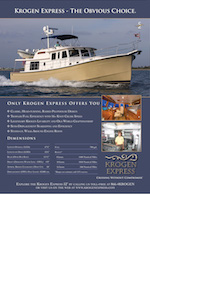 Since our last entry we have logged many hours up and down the east coast of the States and exhibited a boat in 17 boat shows; and in March 2014, we hosted a Krogen Express owner’s rendezvous at Ocean Reef Resort in Key Largo, Florida. It was a fun three day event spent at a lovely spot with great folks! We hope that all the Krogen Express fans, owners, and wanna-be owners will enjoy our entries this fall as we cruise north bound for Newport, Rhode Island, and then work our way south for shows in Maryland and Florida. We pride ourselves in identifying the Krogen Express owners as members of the Krogen Express “family”, and we hope that you will feel that way too through this blog. If you would like to read earlier blogs, check out the blog “archive”. You can also find some postings on Facebook, if you would like to check that out. We departed from Hilton Head Island, South Carolina this morning, August 10. As it was home for us for about 11 years (and was the home of Betsie’s parents for many years), we really enjoyed having a few days there. We went out the Port Royal Sound inlet into the Atlantic, and turned left, bound for Isle of Palms, just north of Charleston. Although a little choppy, it was a following sea, so it gave us a nice boost, allowing us to arrive ahead of schedule. In fact, we were able to meet up with some ol’ college friends who were vacationing in the area! It’s always fun to have surprise get-togethers like that! Zoey enjoyed her first full day of boating, and fared very well. But, even more, she enjoyed the grass under her feet when we arrived at the marina! The sun had just risen when we left Isle of Palms. That’s such a nice time of day to be on the water when things are quiet; and that particular stretch of the Waterway is undeveloped and natural. The dolphin were riding our bow wave, the sun was peaking up over the green sea grasses, and I had my cup of coffee!! All was well with the world!! A few hours later the green-head flies arrived (ugh!) and the sun got hot! But the scenery along the Waccamaw River (see pic lower right) made up for it. Gorgeous! We arrived without incident at Barefoot Marina in Myrtle Beach about 5, plugged in the power cord, and cranked up the air conditioning. Ahhh. The next morning, we cautiously proceeded through the “Rock Pile”. In the boating world, Myrtle Beach is known for the infamous “Rock Pile”, a man-made canal-like section of the ICW. It spans a distance of about 5 miles. The canal is narrow and lined with submerged rocks and a rock shelf, just a foot or two below the water’s surface. When the Army Corps of Engineers was building this portion of the ICW in the 1930’s they encountered a sold shelf of granite. The Corps simply blasted through this obstruction, but, over the years, the soft silt above and below this rocky outcropping has washed away, making the canal now appear wider than it really is. It can be very dangerous and costly to the inattentive captain. On the other hand, our Director of Yacht Services, Captain Andrea Gaines, has done it at night! She’s good. Really good! This picture to the left shows us passing a single file parade of boats traversing the Rock Pile. You can’t see the rocks, but they’re there! Every time we make this tripalong the Intracoastal Waterway (ICW), we find more and more shallow (or “skinny”, as John calls them) areas. Chronic shoaling along the 1,100-mile section from Norfolk to Miami plagues everything from private yachts to tugs with barges, charter fishing boats and passenger vessels. This part of the ICW is made up of naturally deep estuaries, rivers and sounds connected by manmade “cuts” through land areas and shallows which has earned it the nickname “The Ditch.” It is these cuts and dredged channels, as well as secondary channels running inland and connecting channels to ocean inlets, that require periodic dredging to keep traffic flowing. Unfortunately, the Federal government – and many State governments – keep cutting dredging budgets. This is why we appreciate the 4′ draft on the Krogen Express. It would be pretty dicey if it were any more than that! ← So Many Wonderful Friends!